1. We’re expanding to a bigger factory in Catawba County! Early in 2015, we’re setting up shop at the Catawba County EcoComplex in Newton, NC where we can make a lot more biodiesel. Plus, we can expand into new markets, since we are the first biodiesel producer in the Charlotte area to make fuel from used cooking oil. And we’re still going to be here 100% for our fuel customers and restaurant clients in Western North Carolina. One thing we love about making biodiesel is the way it connects us to the community: from farmers who grow oil crops, to restaurants that recycle their used cooking oil, to our partners in the green economy, to our awesome customers who use biodiesel to heat their homes, run their vehicles, and power their businesses. We’re going to keep our biodiesel distribution hub and a used cooking oil collection hub here in Asheville — so we can keep our local economy and community growing. 2. Our new factory takes green building to the max. We’re moving into the Biodiesel Research Facility in the Catawba County EcoComplex — which is LEED Silver certified. Kudos to Catawba County for making this facility a model of smart, sustainable design! Among its green building credentials, the facility is powered by methane gas captured at the adjacent landfill. That means that one waste product — landfill gas — will power the factory where we turn another waste product — used cooking oil — into clean, renewable biodiesel. You gotta love that! 3. 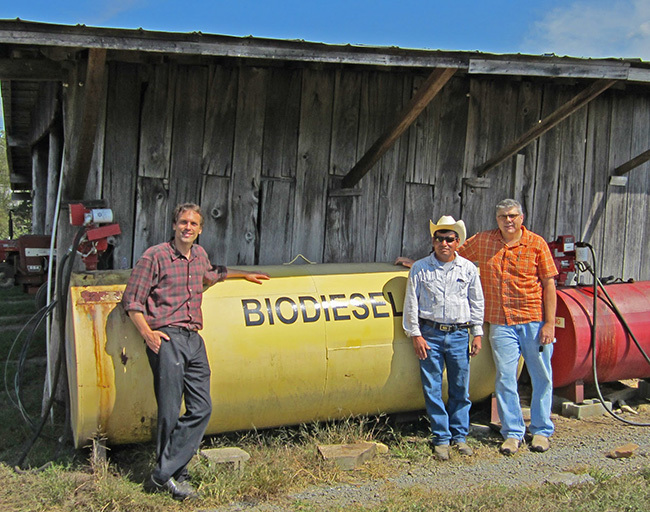 Self-Help is betting on Blue Ridge Biofuels — again. 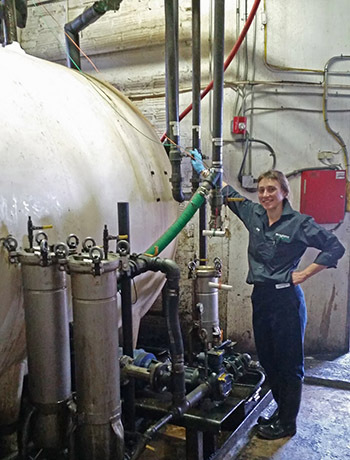 We need financing to grow our business, but what bank would bet on a local biodiesel company? Self-Help Credit Union is that bank. Self-Help invests in our community by financing local green businesses and nonprofits, as well as low-income individuals. Blue Ridge Biofuels received two loans from Self-Help in our earliest days. We wouldn’t be here today without their belief in our business and we’re proud that they see us as a solid bet for the future. 4. The public sector wins and the private sector wins. We’re renting space in the EcoComplex from Catawba County and installing equipment for a state-of-the-art biodiesel factory. This is a deal where everybody wins. Catawba residents will have access to biodiesel fuel which will also power equipment at the landfill. Local taxpayers will get tax revenue from a new business in the EcoComplex. The community gets new Living-Wage Certified jobs. Area students get research and teaching opportunities. And we get a great facility that runs on clean power! And because biodiesel has lower greenhouse gas emissions than petroleum diesel, we’ll be cleaning up the air. Biodiesel: great for engines, for the environment, and for economic growth, too. 5. We can claim the top certification in the biodiesel industry. 2015 marks Blue Ridge Biofuels’ first full year of BQ-9000 certification — the highest standard of quality for biodiesel producers. This is the standard you’ve got to meet in the big leagues — and Blue Ridge Biofuels is one of the smallest biodiesel companies in the US to attain it. BQ-9000 certification opens up new possibilities, since many large-scale biodiesel customers require it, including the City of Asheville and the NC DOT, the largest consumer of biodiesel in the state. Being BQ-9000 certified means that we are producing and selling the highest quality of fuel possible. 6. Peak Energy is now delivering Bioheat. We’ve launched a new partnership with Peak Energy, a local WNC company that’s been delivering home heating oil since 1952. These guys are pros at fuel delivery. This way, we can make sure our WNC Bioheat customers get top-quality service as well as top-quality fuel. This partnership increases our distribution range, allows us to focus on making more biodiesel, and provides our customers with excellent delivery service. 7. We’re ramping up to 3 million gallons of biodiesel per year! With so many great partners, top-notch certification, and a larger facility, we can seriously expand our production. In 2014, we had one of our strongest years ever, producing over 360,000 gallons of 100% biodiesel. That means we kept over 3,300 tons of CO2 out of the atmosphere last year alone. In 2015 during our first year in the new facility in Catawba County we’re planning to increase production to 1 million gallons. The next year, we plan to take it up to 2 million. And the following year, our goal is 3 million gallons! For North Carolinians, that’s a lot more clean air and a lot more good jobs. Thanks for helping us show what the green economy can do! 2 Comments on "7 Reasons We’re Excited for 2015"
That's great news Woody! So happy for ya and keep up the great work!! !